The Quest for His Grave, Lost and Not Yet Found"
"It is not clear, though, in which drawing the ship sails and in which it docks. The author notes, however, that the skies have turned darker in 7. Neither is it clear whether the predominant colour, the seventh in any rainbow, will turn red or blue, as in a litmus test." - "If this book is flirting with the unscholarly, again, if it is free-wheeling writing, as was already a comment on the first part, I confess that the enclosing chapters of this sequel hardly fit the main body and may force me to write a more fictional and third book". - "Still and eagerly awaiting the technical results of the second phase, the search for the lost grave will never be the same anymore." Sold out, but still a few last copies available. Here you can read the first chapter. 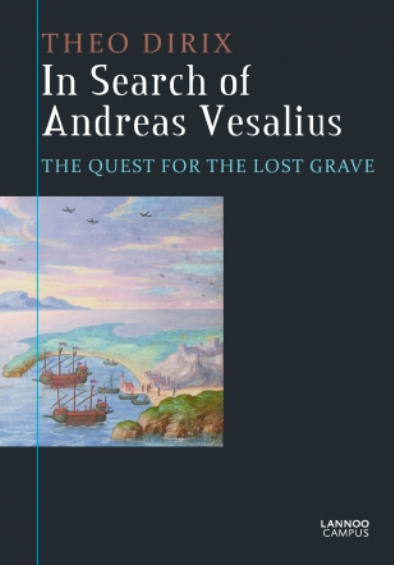 Readers of In Search of Andreas Vesalius may want to download its Index nominum on the website of Maurits Biesbrouck: www.andreasvesalius.be : scroll down to Indices nominum, nr. 3, (pdf – 235 kb). But what if, indeed, only the next one matters?